Governance, risk management and compliance (GRC) processes are extensive; they are how an organization is directed and managed to achieve goals, considering risks to achievement, and complying with applicable laws and regulations. Issues around information have become central to organizational strategies and GRC software is needed in organizations, and investment in these areas has been increasing. The GRC software space is vast with over 400 GRC software providers that span multiple categories and sub-categories of GRC related software. - How to understand your organizations functionality needs. - Guidance for selecting the right partner including examples of good RFP questions. - How to sift through the different solutions and make weighted assessments against solution criteria. - Core maintenance and ongoing feeding requirements. Colin Whittaker, Moderator. Panelists: Stephen Boyer, BitSight; Jon Siegler, LogicGate; and Justin Fier, Darktrace. With large-scale data breaches continuing to make the headlines in 2018, Today’s organizations face a cybersecurity landscape more difficult to navigate than ever before. When it comes to data breaches, the risk for organizations is high, from the easily calculable costs of notification and business loss to the less tangible effects on a company's brand and customer loyalty. Cyberattacks that target and infiltrate critical infrastructure are very real and for the United States, it’s not a matter of if, but when. - Implement security analytics for incident detection and response. - Quickly determine the extent of a compromise once a breach is detected, and understand the steps necessary to contain the affected systems. - Leverage AI to autonomously respond to emerging threats before they can do serious damage. - Understand key information that needs to be communicated to various stakeholders in the event of a breach. - Apply a “standard of due care” in order to prove compliance to regulatory agencies. Colin Whittaker, Moderator. Stephen Boyer, CTO at BitSight; Marc French, SVP at Mimecast; Scott Petry, CEO at Authentic8. Compliance is a fundamental pillar to effective risk management at any company. However, simply complying with laws and regulations without considering the broader threat landscape can result in disaster. Certainly, a balance between compliance and risk is necessary. Ensuring compliance represents an organization's starting point, not the endgame, should be a priority. - Aligning risk and compliance metrics and controls across functional domains. - Benchmarking existing process for managing the risks identified by stakeholders. - Creating a transparent 'system of record' and collaborative process life-cycle management system. - Prioritizing control efforts accordingly. - Aligning compliance investments with compliance risk ratings and business priorities. Data protection laws such as the General Data Protection Regulation (GDPR) are complex, and can impact a broad range of business roles, including legal, audit, HR and finance, not just IT. In achieving GDPR compliance, organizations should focus on getting these roles to work together in ongoing efforts to ensure governance, risk and compliance (GRC) across an organization, and not be distracted by the noise in the marketplace. Through the process of integrating GRC practices real value can be achieved, as long as all stakeholders work with one another and take practical, measured steps toward integration. Join our panel of experts on this CPE accredited webinar to learn how your organization can achieve this. - Find out how to align risk management with enterprise performance management under the GDPR. - Learn how to work with stakeholders to effectively integrate compliance activities, and gain transparency, efficiency and agility for process operations. - Discover how to identify and manage the digital risks that matter, and which risk functions need to transform. Colin Whitaker, Moderator. Nick Hayes, Forrester; Viktor Culjak, ACL; Cameron Jackson, Riskonnect; James Maude, Avecto. In today’s world, implementing an effective GRC program is critical for every organization striving to secure the enterprise in an era of increasingly frequent and complex cyber threats. However, getting budget approval, organization buy-in and executing on a successful implementation can be daunting tasks to take on. Join our panel of experts on this CPE accredited webinar to discover some of the best practices for GRC Implementation and Enterprise Security in 2018. Qualifying participants will earn 1 CPE credit. 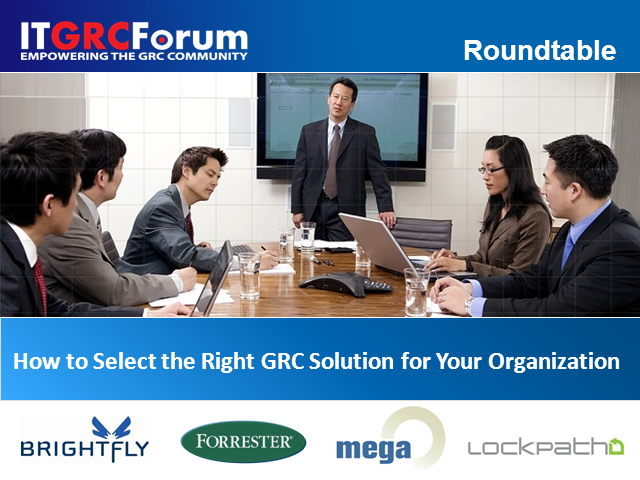 •Find out how to influence the correct stakeholders to successfully implement GRC at your organization. •Learn basic security fundamentals to reduce the attack surface and secure the lines of defense. •Discover strategies to mitigate threats and manage Reputational Risk. Rebecca Herold, Moderator; John McLeod, AlienVault; Mark McGlenn, Absolute; Brian Philbrook, OneTrust; Jake Olcott, BitSight. The GDPR is the most significant change in data privacy regulation in more than 20 years. It comes into force on 25 May 2018 and will impact all businesses that process personal data or businesses that process personal data of EU citizens even if they are not in the EU. Obligations for compliance will affect both controller and processors and regulators will get increased enforcement powers and the right to impose fines of up to 4% of global turnover for both data breaches and infringements of the law. Attend this CPE accredited educational webinar with our panel of experts to learn what you need to know about the GDPR and how to remain compliant. Effective risk management is critical for every organization, especially in the current era of increasingly frequent and complex cyber threats. Organizations with the ability to detect changes across global IT environments in real time can better prevent and respond to malicious acts such as ransomware/malware attacks and configuration tampering. Join our panel of InfoSec experts on this CPE accredited webinar to learn how your organization can take command of risk to proactively prioritize and address the risks that matter most, and ignite your risk management program to enable cybersecurity. Dr. Branden Williams, with Timothy Yim, Imperva; Barbara Cosgrove, Workday; Sue Habas, ASG; and Naheed Bleecker, TrustArc. The new EU General Data Protection Regulation (GDPR) rule looms and will take affect in May 2018, but only a third of companies are on track to be compliant by the due date. GDPR is the most significant change in data privacy regulation in more than 20 years. It represents an extraordinary shift in the way businesses will be expected to operate when they gather, process, maintain, and protect customer data. Any organization that retains information of EU citizens must be in compliance or face huge fines of up to 4% of worldwide turnover. In this webinar series you will hear from industry experts facing the same challenges you face and find out how they're meeting and surpassing critical implementation check points, and you will learn what actions other organisations are taking preparation for data protection – not only for GDPR, but for long-term data protection. Attendees can earn 1 CPE credit on this session. As the number of internet-connected devices skyrockets into the billions, a data security strategy is an increasingly important part of any organization’s ability to manage and protect critical information. Enterprises are migrating to the cloud in droves, however, protecting data in the cloud remains a challenge as employees push to access cloud apps from any device, anywhere. In the last year alone, 1 in 3 organizations were hacked more than 5 times, and with the increased number of attacks the financial cost of security incidents is also rising. In many cases, breaches are caused by a combination of benevolent insiders, targeted attacks, and malicious insiders. For example, targeted attacks are often enabled inadvertently by well-meaning insiders who fail to comply with data or security policies, which can lead to a data breach. In this webinar, our panel will discuss major trends impacting cyber security – from the rising frequency of attacks and types of threats that organizations should be concerned about the most, and they will adress the risks, priorities, and capabilities that are top of mind for enterprises as they migrate to the cloud. The IT GRC Forum produces online events and provides professional networking facilities and market intelligence to Governance, Risk Management and Compliance professionals.